Mr. Sauer begins by promoting the falsehood that “temperatures exceeded what we have today at a time (the Medieval period) when today’s industrialization did not exist”. That is so shopworn a myth that it ranks among the top climate change denier talking points (see the response to this myth by the scientist-run website Skeptical Science). The scientific consensus today is that, while some regions of the globe were relatively warm during the Medieval era, the warmth was not nearly as widespread as today. The overall warmth of the globe and northern hemisphere today is substantially greater than during Medieval time. 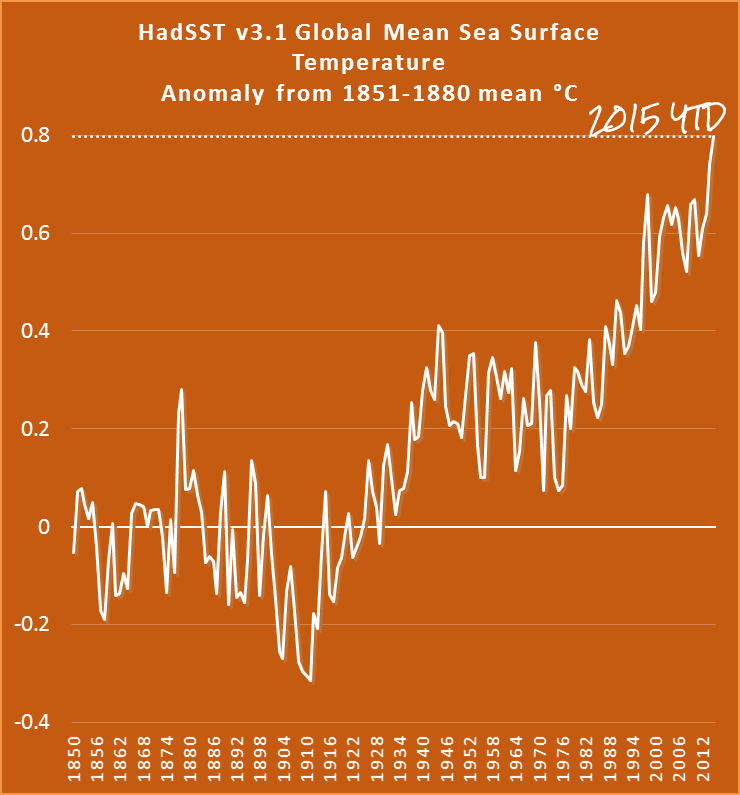 Mr. Sauer might also want to take note that the year 2015 is off to the warmest start ever, 2014 was the warmest full year on record, and took place during the warmest decade on record. A couple of days ago I wrote about how Anthony Watts used a wonky chart of temperatures on the summit of the ice sheet in central Greenland, arguing that it "proved" that Professor Mann and all the world's paleoclimatologists were wrong and he, science denying conspiracy theorist was right. the temperature of the ice sheet in Central Greenland in 1855 was a good proxy for global surface temperature of 2015.
if it was widely cold more than 11,500 years ago (the Younger Dryas), then it must have got hotter globally 1,000 years ago. You say "huh? where's the logic in that?" and I say "there's none". Well, Anthony's doubled down, shifting his focus to a mountainous region in Spain (archived here). Today Anthony's back, in a vain attempt to rescue his tattered reputation. This time he's moved from central Greenland to north east Spain. He's claiming that global surface temperatures can be derived from temperatures high up in the Pyrenees in north east Spain. Not only that, but he's claiming that a temperature reconstruction dating back to 1300 AD, proves that the medieval climate anomaly, that occurred from 900 to 1300 AD (probably peaking from 950 to 1100 AD), was global. Someone needs to sit down with Anthony and give him a lesson in both history and climate. Someone needs to let him know just when the medieval era was. And they need to explain to him when the warming, which happened in parts of Europe, took place. They also need to explain to Anthony the implications of him arguing that the Little Ice Age wasn't all that cold after all. And how one cannot draw any conclusions about global temperatures in the Little Ice Age from a temperature reconstruction based on trees in the Pyrenees in Spain. Casting spells or casting doubt? Except of course it didn't cast doubt despite Anthony wanting it to. Deniers never doubted that global warming isn't happening, or that if it is then it's "not us", and that if it is "us", there's nothing we can do to stop it, and if there is something we can do to stop it, then we mustn't. That covers some WUWT deniers. Others reckon that not only is global warming not happening, but an ice age is coming. Deniers don't have any doubt. They might not have any coherent, consistent notion about climate, but they have no doubt in their often contradictory claims. So Anthony's silly article did nothing to their doubt. They had none before or afterwards. Rather than casting doubt, I think someone may have cast a spell over Anthony Watts. Practically every time he writes an article he looks more and more stupidly ignorant. He shows that he doesn't understand history (he doesn't know when the medieval era was); he can't read charts; and he doesn't know the difference between local and global. [A] recent paper suggests tree ring proxies (which underpin Mann’s Hockey Stick Graph that largely kicked off the global warming scare) have underestimated past temperatures, which creates the misimpression that current warming is unique. Here we use detrended δ13C measurements in Pinus uncinata tree-rings, from the Spanish Pyrenees, to reconstruct decadal variations in summer temperature back to the 13th century. Nowhere do the authors make any suggestion that their paper is a global reconstruction. Of course they didn't. It was a paper reconstructing temperatures of the Pyrenees in Spain. Last I looked, just as the icy cold Greenland summit isn't the whole world, neither are the Pyrenees in Spain the whole world. But Anthony decides to draw attention to a comment from a denier, on the WUWT facebook page, about a paper discussing the merits and difficulties of using carbon isotopes to help determine past temperatures. Increment cores from living trees and dry-dead wood were collected (Fig. 1) to develop a continuous, millennium-length Pinus uncinata composite chronology for the Central Pyrenees (Büntgen et al., 2008). The sampling site is located near lake Gerber (42°38'N, 1°06'E) at the upper treeline (2400 m a.s.l. ), where traditional tree-ring width (TRW) and MXD data have been shown to contain a summer temperature signal (Büntgen et al., 2010). From a total of several hundred Pinus uncinata sampled during several field campaigns, 31 trees were used to develop a stable carbon isotope ratio chronology spanning the past 700+ years with a fairly stable temporal distribution, ranging from 5 trees in 1300 C.E. to 13 in 2000 C.E. (bottom panel of Fig. 2). Figure 2 | δ13C age-trend detection, correction, and chronology characteristics (d) Temporal coverage of individual trees throughout the past millennium. Dark grey indicates the number of missing innermost rings on core samples. You can see why the authors didn't focus on the Medieval period. There is only one tree that that covers the period from 1000 CE to around 1220 CE. it is not a multi-proxy study - it is solely derived from tree rings in the Pyrenees. it is showing the Little Ice Age wasn't quite so icy in the Pyrenees in Spain as it may have been in other parts of the world. Now deniers like to boost up the temperatures of the Medieval Climate Anomaly and drop down the temperatures of the Little Ice Age. In his WUWT article, Anthony does almost the opposite. He writes about a paper that doesn't start a reconstruction until well after the any medieval warming. And Anthony is trying to claim that it has "underestimated past temperatures". In other words, he is claiming that the Little Ice Age wasn't as cold as most reconstructions show it to have been. From the Esper et al. 2015 paper, note that the black line represents the instrumental record. 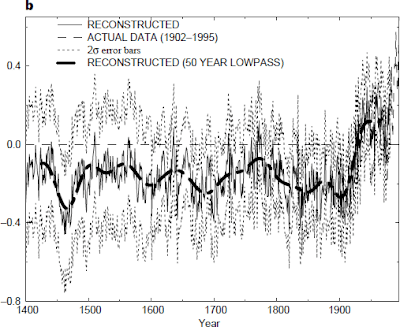 The reconstruction, in red, shows Medieval Warming Period is clearly seen to have temperatures greater than the current modern period. As for the divergence of the instrumental record against the reconstruction, it is important to note that the trees sensing temperature aren’t near human habitation as most of our observing thermometers are, but rather in the Pyrenees mountains. Fig. 5. δ13C based JJA temperature reconstruction and comparison with existing estimates. 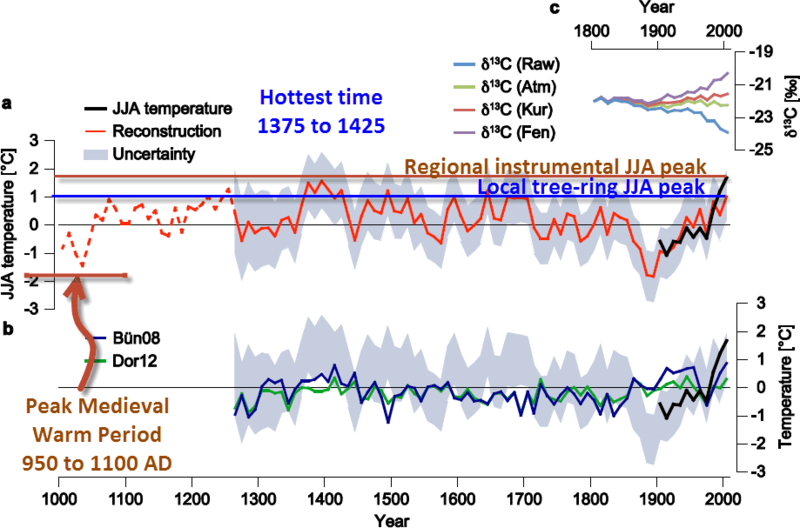 (a) Decadally resolved temperature reconstruction back to the 13th century derived from regression against JJA temperatures. Dashed curve indicates the period prior to 1260 C.E. when sample replication falls below three trees. The SE uncertainty band is derived from calibration trials against JJA temperatures using less-replicated chronologies to assess climate signal strengths during earlier chronology periods (see Methods). 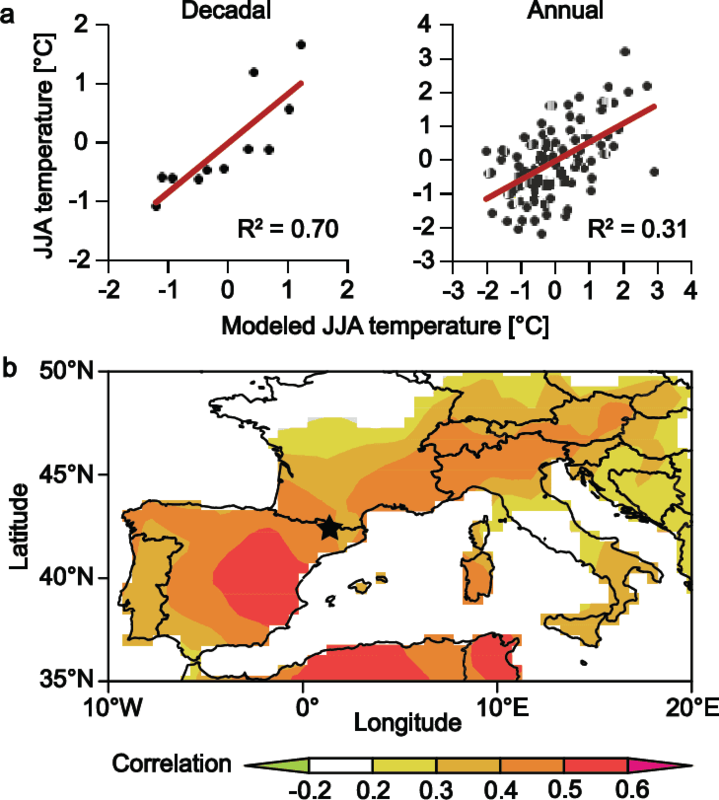 (b) MXD based JJA maximum (Büntgen et al., 2008) and May- September mean temperature (Dorado Liñán et al., 2012) reconstructions, plotted together with the regional JJA temperatures and uncertainty band from (a). All timeseries expressed as anomalies with respect to 1961–90. (c) Recent δ13C chronology tails for the raw data and data after application of the Atm, Kur, and Fen corrections to account for atmospheric 13C/12C ratio and tree physiological effects. In his last article on the subject, Anthony seemed to confuse the Younger Dryas, which ended 11,500 years ago with the Medieval Climate Anomaly. This time I don't know when he thinks the Medieval Climate Anomaly occurred but it wasn't in medieval times. That's off to the right of the chart and isn't part of the main reconstruction. He also seems to think that the line showing instrumental temperatures (in black above) are artificially high toward the end because of the UHI effect. 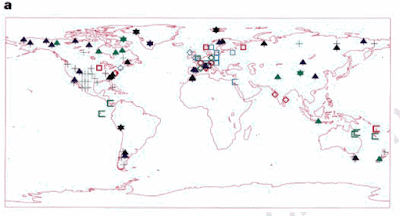 The authors on the other hand, calibrated the tree ring data against instrumental data. So Anthony is both accepting and refuting the paper that he claims proves something about global medieval temperatures. Fig. 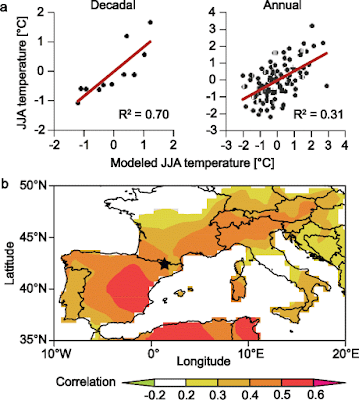 4. δ13C calibration against regional JJA temperatures. 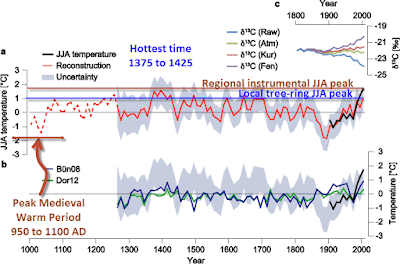 (a) Distribution and linear trends of the decadally (11 values) and annually resolved (109 values) δ13C and JJA temperature data over the 1901– 2009 period. (b) JJA temperature correlation field of the annually resolved δ13C data. Star indicates the location of the sampling site. The article was authored by a team led by Jan Esper, head of the Department of Geography, Johannes Gutenberg University, Mainz (and Head of Dendro Sciences Division, WSL ETH Domain, Birmensdorf). He has done a lot of tree-ring based temperature reconstructions. Jan has contributed to the PAGES 2k project, co-authoring the 2013 paper in Nature Geoscience: "Continental-scale temperature variability during the past two millennia". I wrote about that paper at the time it was published. Deniers really don't like PAGES 2k work, because it shows that Michael Mann is correct when he says that globally it's hotter now than it was in medieval times. In the first IPCC report, presentation of temperatures over the past millennium appears to be a hand-drawn sketch of how climate varied. A prominent MWP, followed by a cold period—the LIA—are observed with clear indications for high natural variability of the climate system. It was demonstrated that this figure was derived from the groundbreaking work of H. H. Lamb representing temperature change over Central England, but the chosen smoothing and figure description suggested more of an illustration, rather than quantification, of past temperatures. This curve presenting a Eurocentric schematic view of climate change, left room open for a completely new temperature history. I don't expect Anthony Watts will be promoting that paper any time soon. To round off, below is Figure 4 a and b from the 2013 PAGES 2k paper, I've added some annotations (as an animation) so you can more easily see the 30 year average temperature up to 2000, as well as the periods spanning the medieval climate anomaly (900 CE to 1300 CE) and the little ice age (16th to mid 19th century in Europe). Click to enlarge it. As you can see, with more and more studies being added, the picture of past global surface temperatures is becoming more clear. Note however, that the reconstructions in the top panel are for the northern hemisphere only. The bottom panel is "across all seven continental-scale regions", so it's effectively global land surface temperatures (not including the sea surface). This reconstruction is based on one location so it does not represent a fundamental challenge to Mann’s global reconstruction. “Because Graybill’s bristlecone chronologies were so heavily weighted in the Mann reconstruction, demonstrating out-of-sample validity at Sheep Mountain and other key Graybill sites is essential to validating the Mann reconstruction out of sample.…In the Figure below, I’ve started with the Sheep Mountain chronology as used in Mann et al 1998 (left panel). As CA readers are aware, it has a very dramatic HS-shape and is heavily weighted in the MBH reconstruction. Indeed, without the Graybill bristlecones, the MBH reconstruction is basically noise. So, “Luke” if Mann heavily weights a proxy in one location to make a global claim, does that make it OK for him, but not for anyone else? There is so much wrong with Anthony's excuse that it's hard to know where to begin. Let's start with Anthony deriding MBH98 for relying heavily on one proxy series while at the same time holding it up as an example that he should follow. Another major problem is that Anthony knows that over the past 17 years there have been many more refinements to global reconstructions, by Michael Mann and by lots of other people as well. To use Michael Mann's very first reconstruction paper as an excuse is inexcusable. Since Anthony doesn't "believe" MBH98 anyway, and says so in his comment, why would he do exactly what he is criticising that paper for? It's worse than that. Although MBH98 did find that a tree series of proxies from North America were critical, that was by no means the only proxy series they used in that first paper. Next - just look at the 2σ uncertainty limits. Shortly afterwards, the same authors focus on just the Northern Hemisphere, in a paper with a title you'd never see on a denier blog: "Northern Hemisphere Temperatures During the Past Millennium: Inferences, Uncertainties, and Limitations." You see, one thing you'll notice about climate conspiracy deniers, like Anthony Watts, is that they are so certain of everything. Scientists on the other hand will quantify uncertainties and describe the limitations to their work. Not so deniers. The cavalier manner in which Anthony both derided MBH98 and decided it did the right thing after all is an example typical of conspiracy theorists, who are able to hold two contradictory notions in their head at the same time. Esper has long been a thorn in Mann’s side. Mann has on occasion attempted to bully him, but Esper has remained independent and resolute. They may not always see eye to eye. However, when Michael Mann pointed out that a 2002 paper Jan Esper co-authored in Science mag was being misrepresented in various places, Esper and his colleagues agreed and wrote a follow-up paper, which clarified their work. And there was a beat-up by fake sceptics over a 2012 Esper paper, too. Michael Mann wrote an article about it at realclimate.org, and welcomed the work, saying it "represents a valuable contribution". Michael Jankowski makes a wrong claim about another new paper, from Oceans2k, which I also wrote about recently. 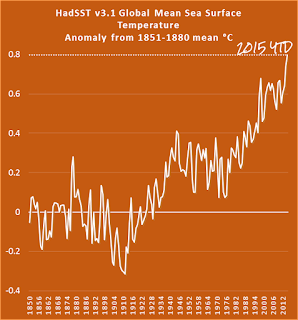 The oceans2k results say we’re far from anomalously warm. Seems that Mann’s results contradict them…yet both are used to portray that man has has a large fingerprint in creating unnatural warming. Well, this article turned into something of a hotch potch, didn't it. Matching Anthony's flailing about all over the place. Not only did I benefit from learning more stuff from all the background research needed, I'm thinking it shows how much under the hammer is Anthony Watts. He isn't getting any support from his readers when he posts nonsense like this. And I'd say he's feeling the effect of being scoffed at by scientists, too (such as here and here). Most Comprehensive Paleoclimate Reconstruction Confirms Hockey Stick - article by Stefan Rahmstorf at Climate Progress. "The map at the bottom of Figure 4 also shows how summer temperatures in Western Europe have increased over the period 1901 to 2010." The values are about the same size, but the Figure 4b shows correlations not temperature increases, according to the caption. Somewhat surprising that the correlation is not highest near the star, that also made me confused at first. I'm thinking that there are probably some other things in the paper that are worth a second look. I'd have thought the LIA would appear sooner, for example, just going by PAGES2k. I'm wondering how much hotter than today it could get and there be any ice cores to analyse. Isn't there some point at which any ice formed in the Arctic winter gets lost in the next summer? I think it will be a while yet before snow stops accumulating in Central Greenland and Central Antarctica. But we are currently collecting all of the data that we glean from ice cores with instruments to greater accurately than ice cores so maybe there isn't as much need for them going forward. I was thinking more about this limits how hot it could have gotten in the distant past if we have still got ice cores from that period. the logic really puzzles me, "if the glaciers are melting and revealing things from the past, then it must have been hotter then than now"
I'm not sure of the reasoning there either, John. The only time that would hold true would be in the case of things being exposed on the ground underneath. Like the study of ancient mosses that were revealed, in some work that was publicised a couple of years ago. Otherwise, snow falls on the glacier and covers up whatever's there until the surface melts and exposes it. As you say, that isn't an indication that it was warmer when the object first fell onto the glacier. I'm guessing the "logic" is based on the assumption of a direct linear relationship between the location of the edge of the glacier and the local temperature. So if it's x degrees today and glacier edge is here, then obviously (!) when the glacier edge was higher up the mountain, the temperature must have been x+, and when the glacier edge was further down the mountain, the temperature must have been x- So it must have been hotter in the past when the glacier edge was further up the mountain and before it grew and covered up this stuff we're finding on the ground. Now excuse me while I go untangle my brain. Ouch. Yes, as Sou notes, it is meaningful for plants/forests etc. But difficult to interpret in the case of human artifacts. 1. An ancient forest has thawed from under a melting glacier in Alaska and is now exposed to the world for the first time in more than 1,000 years. "Glaciers advance and retreat naturally," he says. "So at the top it's cold, snow falls. And then lower down, the ice melts. The glaciers flow naturally downhill, which means that everything that falls into a crevasse… later it appears in the glacier tongue." "The icy world up there is terribly complex - just as complex as the landmass under with all its ridges, gulleys and crevices. We simply never know where and when ancient frozen remains are going to appear." The normal time span for anything trapped in an Alpine glacier to be washed out is, he suggests, between 20 and 50 years, though it can take up to 100 years. The recent examples of Conville, Kobayashi and Oikawa are broadly line with this - it was 34 years in one case, and 44 in the other. When glacial archaeologists recover ancient bodies or artefacts from the mountains it's usually in areas where the ice is not moving, either because the ground is not steep enough, or the ice patch is not large and heavy enough. Thanks for the pointer to the Esper et al paper, which is very interesting. Something of which I'd like to have seen more discussion is the profound cratering of temperature around 1880-1890 in Esper's Fig 5a. The excursion is around 1.5-2 degrees, which is huge even for a regional value. At the very least it reinforces the idea that this site is not representative of global means. But we know that already, so that's uninteresting. Two possibilities come to mind: either there was a sharp regional cold snap during those decades, or there's something a bit wonky with their methodology. Have you read anything about a known deep freeze in that region in the late 19th century? There was Krakatoa in 1883 but even the d13C method shouldn't have smeared out the eruption so greatly as to show a multi-decadal response of that magnitude (that is, if the signal is smeared in time the amplitude should be smaller).